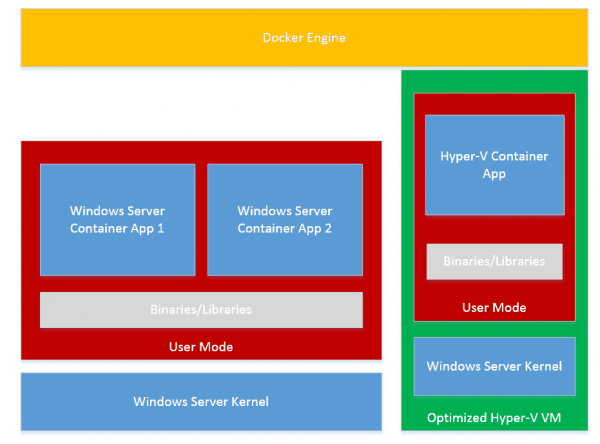 Microsoft's been pretty busy integrating Docker containers into Windows Server 2016, and some of the terminology can be confusing. I'm going to show you what Hyper-V containers are and how to use them in the context of Windows Server 2016. First of all, recall that a Docker container is an isolated application and/or operating system instance with its own private services and libraries. Windows Server 2016 supports two types of Docker containers. Windows Server containers are containers intended for “high trust” environments, where you as a systems administrator aren’t as concerned about data leakage among containers running on the same host or leakage between the containers and the host operating system. By contrast, Hyper-V containers are Docker containers that are more fully isolated from (a) other containers and (b) the container host computer. As you can see in the following architectural drawing, what sets Hyper-V containers apart from Windows Server containers is that Hyper-V containers have their own copy of the Windows operating system kernel and a dedicated user space. The main confusion I’ve had in the past concerning Hyper-V containers is mistaking the containers for Hyper-V virtual machines. As you’ll see in a moment, Hyper-V containers do not appear to the container host’s operating system as VMs. Hyper-V is simply the tool Microsoft used to provide higher isolation for certain container workloads. One more point before we get started with the demo: the container deployment model (Windows Server vs. Hyper-V containers) is irrespective of the underlying container instance and image. For instance, you can build a container running an ASP.NET 5 Web application and deploy containers from that image by using either the Windows Server or Hyper-V container type. Okay, this is potentially confusing, so pay close attention to the following Visio drawing and my accompanying explanation. We’re using the Windows Server 2016 TP4 build, which I’ve downloaded to my Windows 8.1 administrative workstation. Is your mind wrapped around what we plan to do? Starting from our hardware host (A), we deploy a Windows Server 2016 TP4-based VM (B), run the setup script, which creates a container host VM (C). Finally, we can play with containers themselves (D). NOTE: You may have to change the server’s PowerShell script execution policy. 1: Here the script verifies that the server has the containers and Hyper-V roles installed. 2: Here the script creates an internal Hyper-V switch that NATs the 172.16.0.0/24 range. This NAT allows the containers to interact with each other as well as the host. 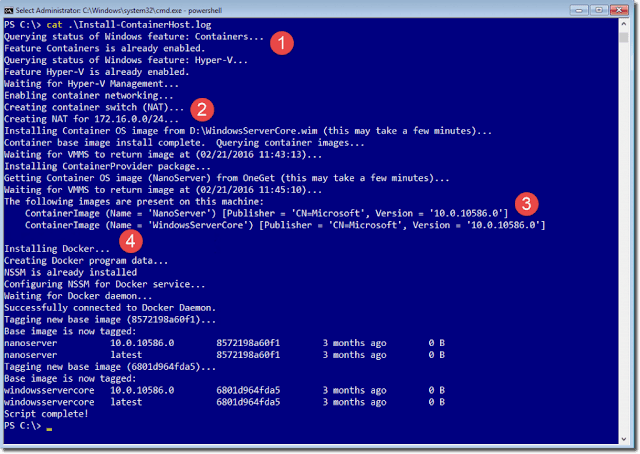 3: Here the script downloads two container images: one is Windows Server Core and the other is Windows Server Nano. 4: Here the script installs the Docker runtime environment. 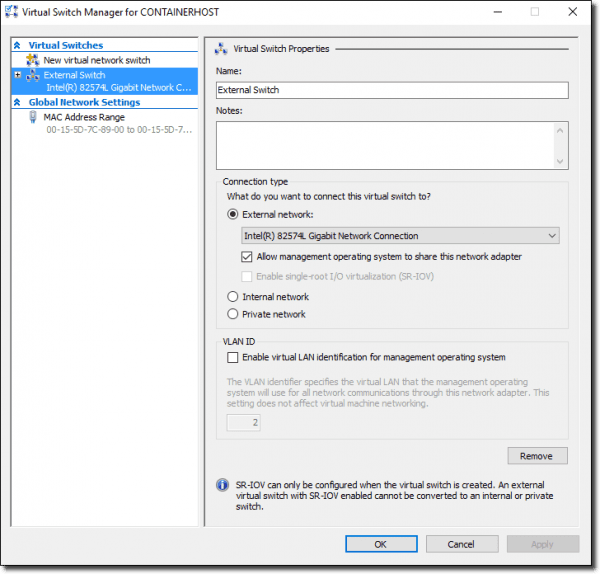 The preceding script created a new virtual machine in your Windows Server 2016 TP4 VM; hence the nested virtualization requirement. In any event, we need to start an elevated PowerShell session in the container host VM that I named conhost1. We’ll create a Server Core container named ‘corecont’ that uses the virtual switch the configuration script gave us. Note the -RuntimeType parameter; that’s the “secret sauce” to creating a Hyper-V container vs. a typical Windows Server container. Acceptable values for the -RuntimeType parameter are Default (Windows Server container) or HyperV (Hyper-V container). Note: I couldn’t get a new Hyper-V container to start in my environment (remember that at this point we’re dealing with super pre-release code). Thus, I’ll start by creating the container as a Windows Server container, and then we’ll convert it on the fly later. In the preceding output, I decided to show you only the internal NAT address that the container host shares with its local containers. What I wanted to show you there is that the container is indeed a separate entity from the container host. We can also verify that our newly converted Hyper-V is indeed completely isolated from the host. The Csrss.exe process represents the user mode of the Win32 subsystem. You should find that Windows Server containers’ Csrss processes show up in a process list on the container host. By contrast, Hyper-V containers’ Csrss processes should not. Sadly, as of this writing I simply could not get my Hyper-V containers to behave correctly. Alpha code and all. Sigh. At the least, though, I can demonstrate the concept in opposite by testing another Windows Server container I build named corecont2. You can see process ID 968 from the perspective of the container host. I submit to you that once Microsoft tunes their Hyper-V container code in a future Windows Server 2016 TP build, running the previous commands will reveal that Hyper-V containers’ Csrss process IDs do not show up from the perspective of the container host.